Discussion in 'Motorsport' started by GTPNewsWire, Sep 3, 2018. This article was published by Andrew Evans (@Famine) on September 3rd, 2018 in the Formula One category. Sureboss and TenEightyOne like this. I hope my fellow countryman will find a seat at another team. Mr Tree and breyzipp like this. I'd rather see him go to IMSA or something and drive competitively. I love hearing the name Felipe Nasr fighting for the lead in DPi when I know just a few years ago he was in F1 purgatory. I mean he has a lot of potential but i'm sure he won't be able to prove it with this team. 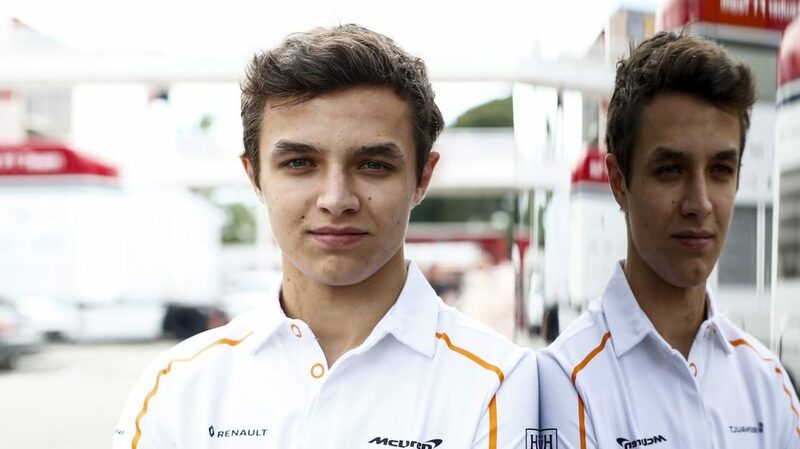 Good to see more and more young talent on F1 . If Stoffel can hear me, I say - do not despair. The misery that is now upon you is but the passing of greed - the bitterness of Zak Brown who fear the way of your progress. The hate of Zak Brown will pass, and McLaren die, and the power they took from the drivers will return to the drivers. Stoffel! Don’t give yourself to brutes - Team Principals who despise you - enslave you - who regiment your life - tell you what to do - what to think and what to feel! Who drill you - diet you - treat you like a number two driver, use you as Alonso fodder. Don’t give yourself to these unnatural McLaren men - machine men with machine minds and machine hearts! You have the love of Belgium in your heart! You don’t hate! Only the unloved hate - the unloved and the unnatural! You have the power to create happiness! You don't need McLaren anymore. Let us fight for a new world - a decent world that will give racing drivers a chance to work - that will give youth a future and old age a security. By the promise of these things, brutes like Zak Brown have risen to power. But they lie! They do not fulfil that promise. They never will! Team Principals free themselves but they enslave the drivers! Now let us fight to fulfil that promise! Let us fight to free the racing world - to do away with national barriers - to do away with greed, with hate and intolerance. Let us fight for a racing world of reason, a racing world where science and progress will lead to all drivers happiness. Drivers! In the name of Stoffel Vandoorne, let us all unite! KepleroGT and Rossell2 like this. McLaren was well justified in replacing Vandoorne, who wan't able to outqualify or out-race his elderly teammate except on very rare occasions. shoemaker and kikie like this. I feel a bit gutted for Vandoorne. Get's paired with one of the best drivers of the current grid and only had one race where he was really able to show off in a decent car - Bahrain 2016, scoring in the points. Since 2017, when he'd joined the team, he had a car, where he couldn't show what he is made of. I hope he'll still be on the grid next year, also keeping my hopes high for Norris and Sainz. It's a shame he couldn't show his talent with this team/car. He was superb in the lower classes now it's looking like a exit cause I don't think he will be able to find a seat in F1. Really a shame but unfortunately thats how it goes. It's a shame; he was a major talent in GP2 and to see him trundling at the back of the grid in a woeful McLaren is just sad. This is a negative post. To be honest, I don't. During the season, Vandoorne was interviewed by a Belgian sports journalist at a track. It was in his (and mine of course) native language and he was bragging about himself. I honestly can't remember what he said but it was not modest, not that he has to be modest but it was the way he said it. If you are talented, you can let the world know how good you're but not how he does it. I do remember though that he literally said that he is the future of McLaren. What he said and the way he said it, and his posture, tells me that he is probably full of himself. I don't know him and I'm not an expert in body language, so I could be seriously wrong though. Okay, it was only one interview, but the first impression I got from him, was not a positive one. I don't like people with that attitude. The Belgian press worships him and say he is super talented. Of course, he is talented and he is fast, there is no doubt about that in my mind but super talented? Come on. I hope that this Norris guy does a better job than Vandoorne. BTW, I'm a seriously talented race car driver. If I had the change to proof myself, I'd be in the top 3 of the current fastest F1 drivers. I am pleased for Norris but gutted for Vandoorne. I think he had a good chance to beat Sainz next year and rebuild his reputation. From McLaren point of view Norris makes perfect sense. If the car quick they can move him aside and bring back Alonso after the IndyCar season Like Williams did with Mansell & Coulthard. Just an idea as to why McLaren Didn't go for Perez, Ocon or kimi etc? I honestly can't remember what he said but it was not modest, not that he has to be modest but it was the way he said it. He said that he thinks he's a better driver than Perez and Ocon. To be honest, it's the only cocky thing he's said since his debut. I don't really see a problem with that one slip-up. You clearly didn't see that interview. It was definitely not a slip up at all. It was on fleetTV. He was more than cocky in that interview. It is probably wrong of me but I don't like the guy since I saw that interview. And I'm not the only one if you read comments on HLN.be. I believe, but I could be wrong, he also said that he is as good or even better than Alonso. He probably never going to say that to an international journalist. But on Belgian TV, he definitely said something in those words. He literally said: "Ik ben de toekomst van McLaren". (= I'm the future of McLaren). Not every driver that had success in junior formula brings that to F1, Vandoorne at no moment showed he had something special and surely if he was going to be something in F1 he would show it by now. Elderly teammate always getting the better car according to our press. Your press is wrong, think about it. Mclaren spends millions on developing a driver only to put him in F1 to make Alonso look good. Think about it McLaren has a ****** car trying to develop it back to a front running car with an ex world champion who do you think is going to get the newest parts? I'm inclined to believe Alobso would it could be diffrent but acting as if this claim is just outlandish is a bit of a stretch isn't it? Doesn't make any sense considering McLaren have had a few drivers in recent history that are regarded as pretty good drivers before come to F1 or during their tenure, and when they went to said team...performance dropped. Now I don't know about you but when I see that type of correlation and the group in charge isn't willing to take blame yet shuffle it off the nearest party available, it tends to tell me they're actively being ignorant. As I said in the driver transfer thread a month ago and on discord. If all you ever know is crap machinery and a simulator and have never driven anything that actually performs well, how do you benchmark yourself? How do you face scrutiny when you're stacked against a two time world champion and your development is questionably stunted? I'm not saying Vandoorne was ever going to be the next big thing like every one was sold, cause I was pretty sure he was always going to end up like Magnussen. To be fair, it is possible that the team around him does not work well with his style. Similar to the way things happen in other sports, changing teams may find him in a situation where his talent and style gel with the rest of the team and produce the results he had in other series. Or it could be that it's too far for him to grow. There is a way to find out but will any team take the chance? He might be lucky enough to get the STR seat though, a side effect of the super license point requirement is that drivers that have the points to get into F1 are a Small Selection. I don't see Vandoorne adding anything to F1. I won't miss him for a second. (I could say the same about a handful of others drivers too though). With that F1 scribbled on your resume you can go race damn near anything else, and have more fun doing it.